Plenty of tools for the iPad let you draw in freeform mode with your finger or a stylus — which is great for rough sketches but not for the kinds of drawings you’d show a client. Fortunately, plenty of good precision-drawing tools are available for the iPad, too. A well-regarded one is the free Concepts, which with the $5.99 Pro Pack in-app purchase becomes business class. Concepts is a great tool for freeform drawings, with a selection of pen types, weights, and colors. With the Pro Pack add-in, you can bring in images from your iPad’s Camera Roll or camera to draw on, as well as work with your strokes in layers, so you have more control over which display, as well as the capability to modify them. Concepts also supports several popular pressure-sensitive styli. Using Concepts’ Share tool, you can share your drawings via email and social media, print the drawings, copy them for use in other apps, open them in other apps, and share a link to the drawing (uploaded to the public Concepts server on the Internet for anyone to see). Your drawings can be exported or shared as JPEG or PNG bitmap images and as SVG vector images. The Pro Pack add-in brings the precision tools that make Concepts shine. 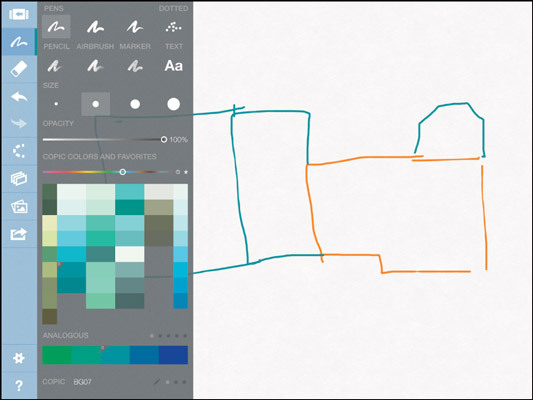 You can create precise lines and curves that, optionally, snap to the grid points on your virtual canvas. Concepts assumes that your next shape should be like the last one, so you can quickly create a series of similar shapes (clones, basically) when needed. And you can switch to a different one when you need to do that, too. The tricky part is that you first have to create the outline and then apply the pen to it. That’s not an obvious approach. Double-tap the Precision Drawing tool to get this set of options: straight line, curve, angled curve (like V shapes), ellipse, and rectangle. Select the desired shape and snap-to options. 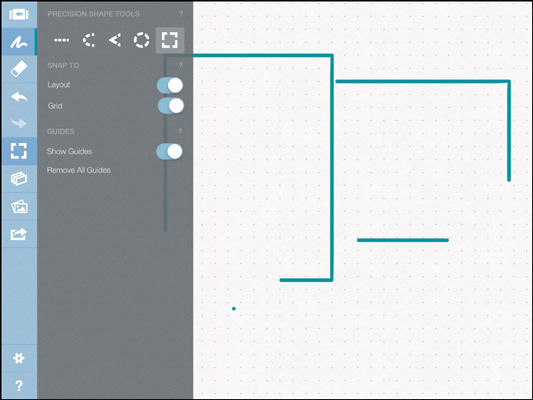 Place two fingers on the iPad’s screen, and draw them apart to create your shape. Take your fingers off the screen when the shape is roughly at the size and location you want. With one finger, drag the selection handles to resize any side of the object, to adjust the curve, or to rotate the object. With two fingers, drag the object to a new location. To actually draw the shape (that is, give it a visible edge), trace along it with one finger; whatever settings you made in the Pen tool (the squiggly-line icon) is applied to the portion of the shape you trace over. To add another shape of the same type, repeat Steps 2 through 4. To add a different shape, repeat Steps 1 through 4. The Concepts method is a bit awkward at first, but if you’re trying to create a series of similar shapes, it can’t be beat. Each new shape of the same type you create in Step 5 mirrors the dimensions or curve of the one you just created, essentially cloning that previous shape as the default for your new one. To edit a drawn object, you can select its layer by tapping the Layers tool (the icon of three stacked rectangles), tapping the Adjust button, and then selecting the desired layer. If you swipe across the layer, you can change the object’s opacity, lock or unlock the layer, copy the layer, or delete the layer using the contextual menu that appears. You can also modify a drawn object by first making sure that the Precision Drawing tool is not active (tap its tool so that it’s no longer highlighted) and then tapping and holding on any part of its stroke. Just be careful: It’s easy to end up drawing a new freeform object instead of selecting the existing object. You use the standard iOS rotate, expand, pinch, and drag gestures to adjust the selected object or the selected layer’s contents. (If no object or layer is selected, the gestures are applied to the entire drawing.) You can also change the pen settings by selecting the object or layer and then switching to the Pen tool to adjust its settings, such as stroke type, size, and color. Use the Eraser tool (the eraser icon) to erase strokes, the Undo tool (the left-facing curved arrow) to undo the most recent action, and the Redo tool (the right-facing curved arrow) to reinstate the most recent undo. What you can’t do in Concepts is edit an object after you’ve moved on to something else — the adjustment handles are no longer available for the existing objects, only for new shapes.